I would have called this article Cereal Killers but realized there is a book by Alan Watson with a similar name, so I decided to pick on numero uno, Cheerios, and call my article Cheerio Killers instead. Cheerios commands13.6% market share in a sea of hundreds of brands. The cereal king and queen are Kellogg, with 32% cereal market share, and General Mills with 28% cereal market share. Boxed refined breakfast cereal is big business (projected $34 billion by 2015 worldwide) and food scientists are busily working to make sure you stay addicted to these magical blends of grains and sugar. They busily market to you and especially to your children with false marketing claims. Cerealfacts.org reported that cereal companies spend more than $156 million per year marketing cereal to children. Healthy Hierarchy: 5 shelves of cereal: the lowest shelf is the least healthy. This is where you’ll find the most cartoon characters (eye level for tots). Top shelf = Cardboard in a box. Somehow in the world of Big Food, companies are allowed to market sugary children’s cereals as “good for you” and “smart choices” when nothing could be further from the truth. WARNING 1: Beware of junk marketing on cereal boxes. 6 sources of blood sugar spiking ingredients. Peanuts and peanut oil are highly allergenic and often peanuts are contaminated with mold. Tricalcium phosphate and calcium carbonate: From rocks. Keeps puffs from sticking together while providing a cheap source of poorly absorbed calcium. Fortified with vitamins and minerals: When Big Food refines and processes grain, anything that was beneficial is lost, so they add it back in (fortification) but use cheap, poorly-absorbed forms from rocks, coal tar and petroleum. The fortified food industry is a $30 billion business and it helps consumers think that eating cereal gets them out of eating their green leafy veggies to get real nutrients. “I think it’s just an advertising ploy and gimmick with no health benefit whatsoever,” said Dr. Tom Ransom, an endocrinologist and obesity expert with Capital Health in Halifax. 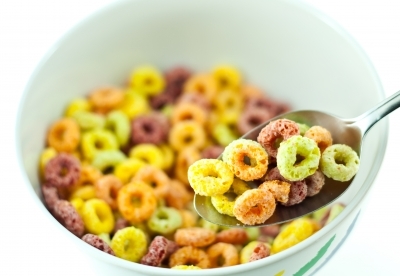 Food dyes in cereal “pose major health risks” triggering behavior problems and cancer, says CSPI. These dyes are linked to allergic reactions and hyperactivity in children. Despite these concerns Big Food puts 15 million pounds of dye into food each year. Franken Poop. Don’t freak out if your poop is pink, blue or red. Food dyes can do that. WARNING 3: Avoid preservatives like BHT, BHA and TBHQ. They can cause behavior changes in some people, and in animal studies these preservatives been shown to be toxic to organs like the liver, kidney and lungs. Known to cause allergic reactions, hyperactivity, rashes, asthma, and other health problems, BHT and BHA are also carcinogenic (but, good news, your cereal will not go rancid for a very long time, and Big Food makes more money). Go to your pantry and look at your cereal. Any BHT, BHA or TBHQ? If that were the only thing wrong with cereal…. How do you feel about organic BHT-free Cheerios? Is it “heart smart” or does it lower your cholesterol? WARNING 4: Avoid ingredients that are made in a laboratory and can’t be easily identified or pronounced. The government gives GRAS (generally recognized as safe) status to a boatload of chemicals that also require MSDS (material safety data sheet) for safe handling. A general rule of thumb, don’t eat ingredients that require MSDS like tripotassium phosphate. WARNING 5: Avoid processed grains and refined sugars. Even if you find an organic “o” cereal it is good to note that cereal in general is metabolically very much like eating Twinkies for breakfast. Most people eat 1 to 2 cups of cereal, so let’s go middle of the road and look at 1.5 cups of Cheerios. This cereal will deliver 40 grams of highly refined grain to your bloodstream, turning into about 10 tsp of sugar. With milk added, it is closer to 13 tsp of sugar (a twin pack of Twinkies also delivers 13 tsp of sugar to your bloodstream). If you are trying to be “extra good” and have juice and a banana with your Cheerios, as the ADA suggests, you are walking away from breakfast with over 1/2 cup sugar blasting through your blood vessels. God made you in such a way that when you wake up in the morning, there is only about 1 tsp of sugar to be found in your blood. See the calculations by Michael R. Eades, MD if you are a doubter. If you are a little person, imagine the bouncing-off-the-wall-ness that will be observed shortly after breakfast. Remember, this cereal allegedly is the cholesterol-lowering cereal that many adults are eating because they have been told it is healthy. Anything that raises your blood sugar (such as highly refined grains and sugars found in cereal, pasta, bread, crackers, chips, and froo-froo coffee drinks) also raises your insulin levels. Some sugar will get into your cells, some will be stored as glycogen for later, but most of the sugar is going to be turned into fat. Sugar is inflammatory and contributes to many chronic diseases. There is no processed cereal that is good for you. Harsh, but true. It is all made of refined grains in some sort of extruded shape. UN. What if its all been a big fat lie and eating fat doesn’t make us fat? Read Gary Taubes article and books if you still believe that you need to eat low fat. Even oatmeal is a wolf in blood-sugar-raising sheep’s clothing. Oatmeal offers lots of carbs that turn into sugar, but delivers very little protein. If you love oatmeal, then be sure to eat a smaller portion as a side to bacon and eggs or a vegetable-stuffed omelet with a side of meat. What’s for breakfast then if cereal is out? Eggs! Pasture-raised real chicken eggs cooked in real butter or coconut oil, with meat (like uncured, nitrate-free pasture raised bacon or sausage), and sautéed veggies. Or maybe a green veggie/berry protein smoothie. Or how about a bowl of chili, or a piece of fish, or tuna salad with your veggies. There are no rules that say Americans have to keep getting fatter and sicker by following the Pyramid-of-doom (remember, “eat 6-11 servings of bread.…”). Here’s a healthy hint: we should not take nutrition advice from the USDA, charged with dual roles, selling more grains and establishing the nutrition rules for America. Perhap$ they have been bia$ed. If you missed 60 Minutes this week, I encourage you to watch this video. If we learned to avoid this sugar and processed grain menace we could potentially avoid 75% of the diseases of our “modern” civilization including obesity, heart disease, type 2 diabetes and hypertension. Eat real food. As close to the way it was created as possible. Shop the perimeter of the store. Find a farmer raising animals the right way. Stop eating out of boxes and drive-up windows and reclaim your health, America! Are you ready to learn how to turn your health around?